Now when Euella was born in Clarksville, Texas, her father insisted that she be named after the most famous man to ever come out of that town – Euell Gibbons - who wrote the classic book Stalking the Wild Asparagus. Actually her name was quite a misnomer as Euella Rose Darling turned out to be the ugliest child in the state. Why they had to tie a porkchop around her neck just to get the dog to play with her. And the dog wasn’t a looker either. But honey that didn’t stop Euella from wearing the brightest clothes or slatherin’ on the makeup. And believe it or not she ended up marrying a millionaire! I just came by to say hello and to tell you I am trying to add a page at the top of my site of people like yourself that sell your beautiful pieces. LOL! Love it, Jill. And Euella is something else. So cute! And I love the dog, too. Did you make them??? Great job if you did! She is adorable! Love the pup, too! Ugly is the new cute, ya know? Just like 60 is the new 45...Thank Heavens! Happy New Year, Jilly Bean! Oh you made me laugh! You are one crazy woman! I love Euella and her story!!! LOL!!! 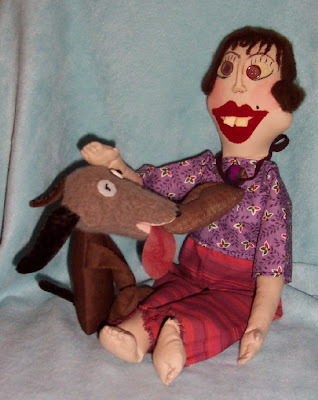 Is Euella related to Flat Betty, who I hope os doing okay? Your doll is incredible! I collect art dolls, and yours is out of this world.